An idyllic anchorage in front of the village of Tekek. Clean clear water. Great snorkeling. Duty free booze. We chilled out on Pulau Tioman (Tioman Island Malaysia). Ten days had flown past before we even noticed. Tekek Esplanade. These guys have been riding motorbikes since they were five. Capital village? Well I guess you can’t call it the capital city. You’ll find one marina, three duty free grog shops and three mini marts in the two street town of Tekek on Tioman Island Malaysia.And a million bats. We were laying bets on the minimum age for motorcycle riders in Tekek. Maybe six years old? Or perhaps it’s a height thing? If you can reach the pedals you’re legal. Helmets might be illegal in Tekek though. I didn’t see one. Unless you count head scarfs? 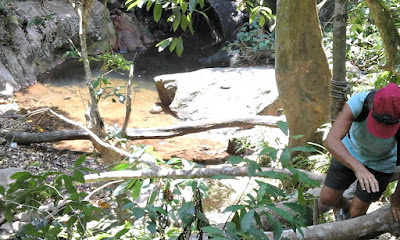 We’d been told about the jungle walk to the waterfall. We got directions from the guys at the Tekek Information Centre. Go right after the first mosque, then was it left after the second mosque? No signage of course. We were lost after the first 20 minutes. No one to ask. It’s a quiet little town. After a few wrong turns we found the trail. Two and a half hours of mostly uphill climbing we found ourselves in Juara on the other side of the island. Alimak! How did we miss the waterfall? 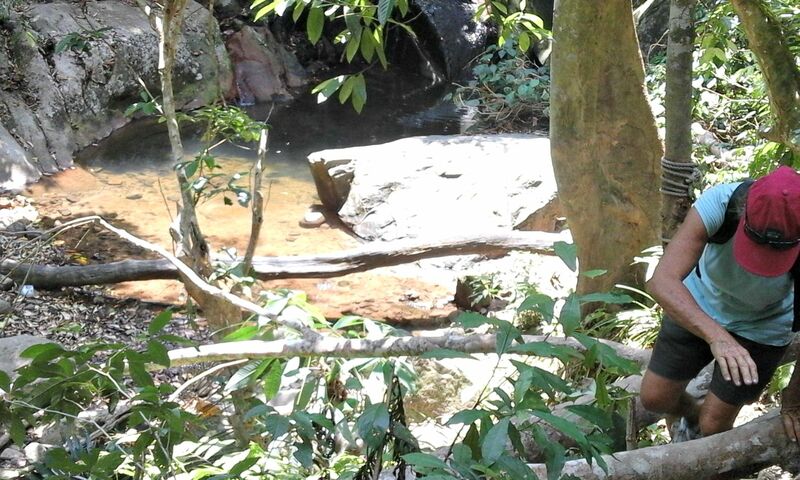 We saw monkeys, butterflies, a spectacular frill necked lizard showing off in all its camouflaged glory. It was an amazing walk. But no waterfall. As mentioned in my blog about climbing Frenchmans Peak, I never said I was fit, just up for it. So it wasn’t a hard decision to take a ride back to Tekek. I talked the driver into stopping so we could check out the waterfall on the way back. Underwhelming. Water but no fall. But I wouldn’t have missed that jungle walk for anything. Despite the way my leg muscles complained for the next three days. Don’t backpackers know how to party anymore? I mentioned Tekek is a quiet town. There are no bars. The deal is you buy your duty free wine or beer or whatever and drink it at the table outside the bottle shop, or take it and drink it with your meal at one of the cafes. 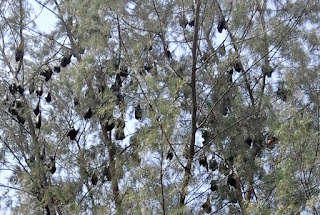 Air Batang or ABC is a three km walk from Tekek. There are bars and backpacker joints for the people who come for diving holidays. The other captain and I thought it might be time for a party night. You know, hit the reggae bars, a few cocktails… It was so quiet we nearly fell asleep! Young backpackers whispering over their bottles of water. Different to when we were there 27 years ago for our honeymoon. Well I think it was ABC. But I guess it could have been another part of the island. 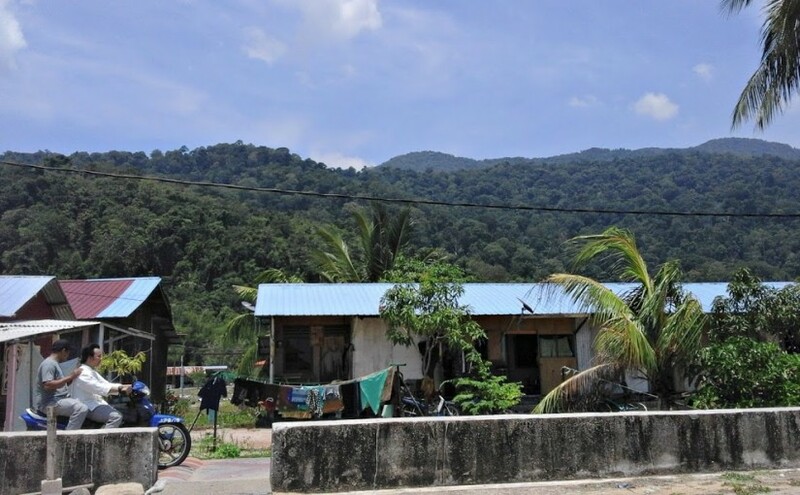 We were in Mersing and the locals suggested we visit the island where they shot the 1958 movie South Pacific. I believe this urban legend is now disputed, but we believed them. Eight hours later, on a slow boat with locals and chickens and goats, we landed at rickety jetty with a backpackers bar. Our accommodation was simple A frame hut for $2 per night. The “ablution facility” was a waterfall, complete with monkeys. But that backpackers bar rocked! N 02 49.333 E 104 09.563 Sand in achingly clear blue water. The Tiny Captain asleep on watch. Again. Four anchorages. Five people on board. Cruising in company with a catamaran. 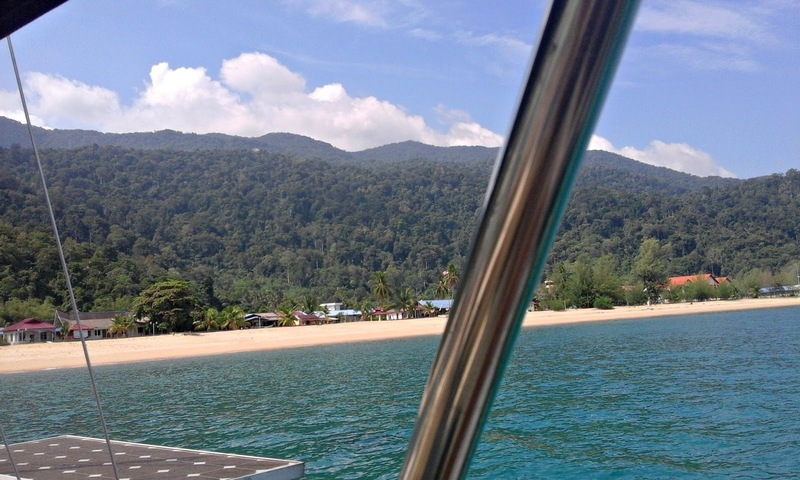 Join our sailing adventures to Tioman Island Malaysia on Yana de Lys. 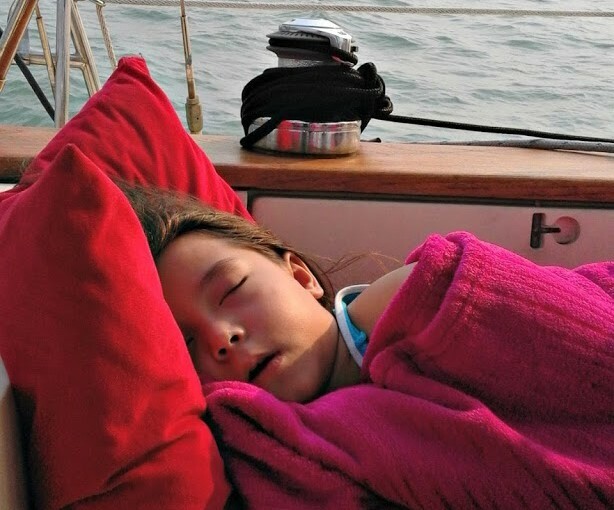 We sailed with our friends Tina, Adrian and their eight year old, Chloe who live in the residential community at Senibong Cove. They liked the idea of sailing, but wanted to experience real sailing adventures. Tina won the World’s Best Galley Slave award. Her meals and OCD inspired cleaning were legendary. Adrian took to the wheel like a duck to water. The other captain didn’t have the heart to turn the autopilot on. Didn’t want to spoil his fun. Our first leg was 20 NM (nautical miles) from the Senibong Cove Marina to Tanjung Pengileh. We were five minutes out into the Johor Strait when two things happened. Chloe asked “Are we nearly there yet?” for the first time. And the other captain reported a hose leak in the engine room. Alamak! Not nearly as serious as when the drive shaft broke. The other captain spent the time at our first anchorage replacing the leaking hose. Kindly supplied, with free advice and reassurance from Adam on Soggy Moggy, (did you guess she’s a catamaran?) our cruising companion. Tina cooked a spectacular dinner. Chloe wanted to know how long it would be before we got to Tioman. We set off early the next day. At one point I counted 101 vessels in the shipping lane. A safety boat stalked us. We’d steamed clear of Lima Pass and North Rock when the hose broke. Again. 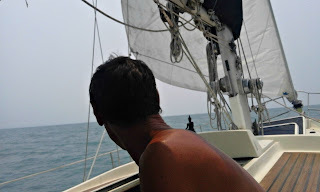 So we sailed most of the way to Desaru in a sloppy swell with the wind directly behind us. The anchorage was very rolly. All night. Our sailing adventure companions were close to mutiny. Chloe wanted to take a speed boat to Tioman. Adrian was seasick. But Tina was fine and managed to cook up a sensational Teriyaki Beef and Rice. We made good time on our 40 NM leg to Pulau Sibu Tengah. And anchored out of the swell behind the resort‘s sea wall. Yay. No more talk of mutiny. We mistook the call to prayer for the call to beer at the resort. Dreaming of cocktails and ice cold beer we rocked up to find an empty resort which didn’t sell alcohol. Plenty of deer, pooping around the pool. But no beer. Kay from Soggy Moggy must have known something we didn’t. Kay declined to come ashore. Citing a good book. Our hamburgers we deesgusting. “Nasty” according to the Tiny Captain. The pool looked okay, but naturally the swim up bar wasn’t operating. I was afraid of catching a disease from simply looking at the skanky service area. Day four was all plain (motor) sailing to our idyllic anchorage at Pulau Tioman. 40 NM at an average of 5.4 knots. The other captain and I were here on our honeymoon 27 years ago. 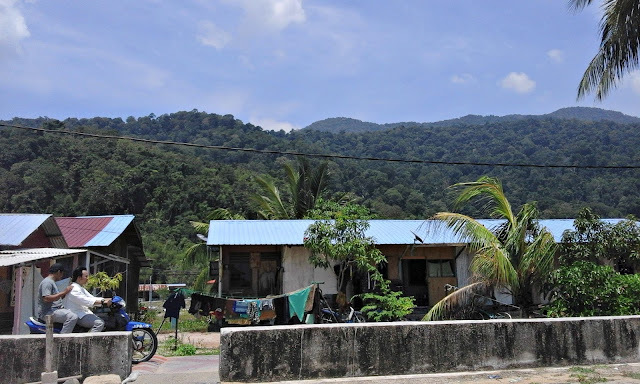 I’ll tell you about Tioman Island Malaysia in my next blog. I have to go snorkeling now. 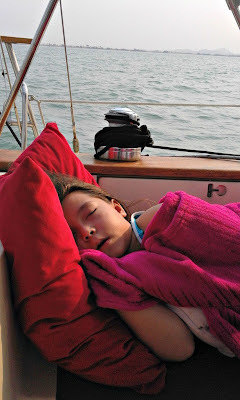 Meanwhile feel free to share my sailing adventures blog! N 01 22.810 E 104 05.506 Excellent holding in mud. N 02.49.333 E 104 09.563 Sand in achingly clear blue water.